Now that spring has (finally) arrived, we’re done talking about the weather! 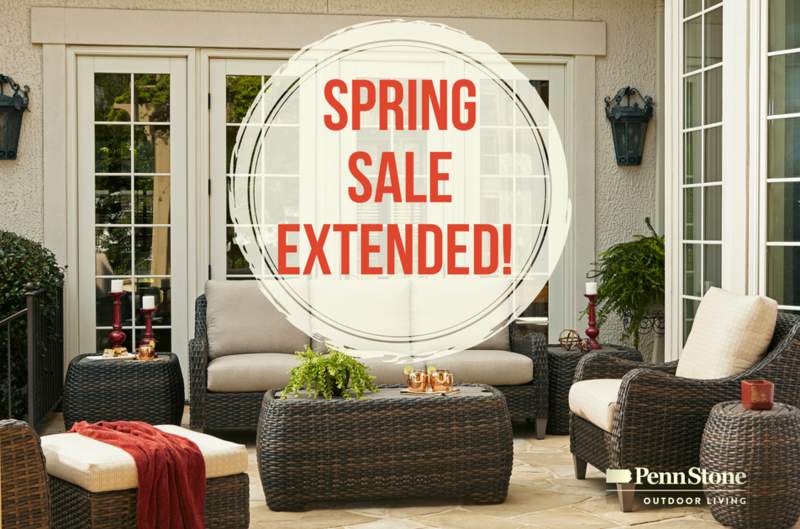 But there’s one silver lining to the never-ending winter for Penn Stone Outdoor Living customers – we’re extending our preseason outdoor furniture sale! Now through May 14, you can continue to save 15% on all* custom-order outdoor furniture orders. Visit our showroom to browse more than 50 collections of outdoor seating and dining in all-weather wicker, cast aluminum, wrought iron, and teak, then work with our talented staff to select colors and cushion fabrics for the perfect furniture collection for your patio or deck. Sale pricing includes leading brands like Gloster, Lloyd Flanders, OW Lee, Barlow Tyrie, LaneVenture, Homecrest, Klaussner, and Tropitone. And because we all know that we’re probably skipping spring and jumping right into summer sun, remember to add a market or cantilever umbrella from Treasure Garden or TUUCI!